When it's over 40 degrees outside, being led to a heated chamber is the last thing you want. Yet, at The Spa, Aman New Delhi, this is exactly what the instruction is. Enter a heated chamber and take a dip in a hot pool in the heated chamber; this followed by another ten rather hot minutes in the steam room. My first instinct was to refuse the 'generous' offer. However, considering I was within the cool confines of the hotel, and had a review to do, I decided to brave the spa heat. Since its launch in 2009, Aman has been synonymous with opulence. The Spa too, is spacious with vaulted mosaic ceilings, dim lighting and a sandstone finish; the collective effect of which, helps cool your heels and makes the experience memorable. The ritual begins with filling up medical history forms and reading disclaimers. After all, you need to understand exactly what you are in for. 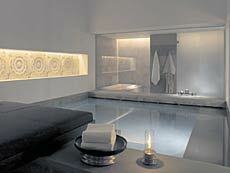 The hamam at Aman has been inspired by the hamans in Turkey that use olive oil as the base in all treatments. I decided to opt for a traditional Turkish treatment-the Posha Hamam Ritual. The treatment involved a waterbased 90 minute detoxification; at the Jaipur chambers, an area housing three heated chambers, heated benches and a heat plinth. The ritual also involves a hot and a cold plunge pool to invigorate you once the haman ritual is complete. So, despite the mounting trepidation, I take the plunge-hot summer afternoon nothwithstanding-and am pleasantly surprised. A dip in the warm pool welcomes relaxation, as the soft sound of water gushing into the pool helps me unwind and finally disconnect from the world outside. My ten minutes are up way too soon and I am then escorted to a heated chamber-the steam room-where I am lulled into a halfsleep, half-awake state after spending a few minutes breathing easy on a heated marble bench, the scent of fresh eucalyptus floating around me. To ensure that the rise in temperature in this chamber does not affect your body's temperament, cool water is poured over you. This ensures that your own body temperature rises systematically and not suddenly, thereby maintaining a steady approach to the treatment. Talk about pouring water on one's dreams! Twenty minutes later (or sooner, depending on how long you can handle the steam), I was led to the cool pool for a quick dip. Taking a dip here is a delight. Experts say that this treatment-where the body temperature is methodically allowed to rise and then fall-prepares the body externally as well as internally to experience the full benefits of a rigorous detoxification process. Lastly, you are transferred to the heated treatment plinth where exfoliation takes place. This laborious process helps rid your body of dead skin and cells. Your skin feels smooth as a baby's bottom after the sloughing process, and the body infinitely less stressed. The heated environs of the Hamam chambers provide just the right setting, as the therapist begins an application of an olive oil-based soap to cleanse the skin and then, massages the entire body. The gentle massage generates warmth that allows the skin to release toxins, and the process is concluded by washing off the lather with warm water. A treatment room and cold water tub filled with rose petals at the spa. Though the exfoliation process requires your skin to be scrubbed, and the cleansing and massage require you to turn around a couple of times, the entire process can lull you into a deep, sweet sleep; it's only when you retire to the bamboo garden that you actually manage to shake off the slumber. To wind up, a traditional snack of hot tea and citrus fruits is served while you revel in the afterglow of a hot hamam session. An hour and a half after tiptoeing into the hamam, I walked out floating, light as a cloud. The therapy brings your skin back to life and allows every pore to breathe.